The Japanese had already swept through much of Burma and were well on the way to India. This week in the war, 1 August 1942, Chinese leader Generalissimo Chiang Kai-shek agreed to a proposal by American Lieutenant General Joseph W. Stilwell that Chiang’s forces should assist in the recapture of Burma. 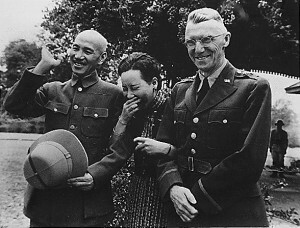 Stilwell—known as ‘Vinegar Joe’ because of his abrasive no-nonsense personality—had been sent to China by Roosevelt and became Chief-of-Staff to Chiang Kai-shek, who commanded the Chinese Nationalist forces that were resisting the Japanese invasion. Chiang’s troops had been fighting the Japanese for the past five years. Stilwell set about reforming the Chinese army and organizing training. The loss of Burma cut the land route to China and, with the coastline controlled by the Japanese, the only way into the country was by air. Huge quantities of American Lend-Lease supplies were flown from India over the Himalayas (over ‘The Hump’) into China to supply Chiang’s forces. This entry was posted in World War II and tagged Burma, Chiang, Chiang Kai-shek, Stilwell, Vinegar Joe. Bookmark the permalink.